Two downtown area streets are closed as preparations for the Columbus Pride Festival are underway. West Goodale Street is closed between North High Street and Dennison Avenue. Park Street is closed between West Swan Street and Buttles Avenue. In addition, West Broad Street will close between Front Street and Starling Street from 7am Saturday until 2pm. 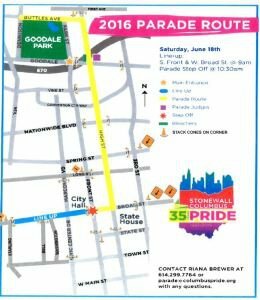 The Columbus Pride Parade will stage near the intersection of Front Street and W. Broad St. beginning at 9:30am. The parade will kick off at 10:30am and go east on Broad to High Street, north on High Street to Buttles Avenue, then west on Buttles Avenue before ending at Dennison Avenue. Streets will be closed as the parade goes along the route. Everyone should enjoy Pride in a responsible fashion, but if you find yourself in trouble this weekend, contact an experienced Columbus Criminal Defense or DUI Attorney.